Here is perhaps the most celebrated West Coast wildflower. 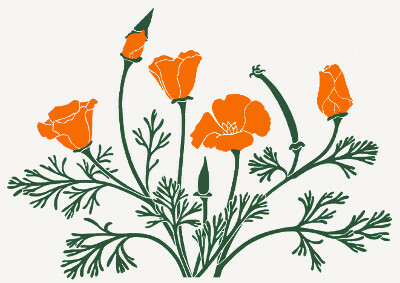 Called Copa de Oro by the earliest Hispanic inhabitants, this golden poppy once emblazoned such vast fields that its brilliant color was visible from sailing ships miles offshore – a plausible basis for the early name La Tierra del Fuego, land of fire. Discouraged by grazing, agriculture, and development, it now blooms in lesser abundance, May-September, from Southern California north to the Columbia River, and elsewhere escaped from garden plantings. This marvelous perennial arises from a deep taproot and generally reaches two feet in height. The flowers are two to three inches across and vary from pale to deep yellow and orange. They are remarkably responsive to sunlight, closing at nightfall or in overcast weather. Sepals are united in a conical structure that is thrust off by the opening petals, much like doffing a little hat. The seed capsule is linear and tipped by the withering styles. The foliage is grayish-green and finely divided. E. Californica owes its introduction to the botanical world to three explorer naturalists and a coincident Russian. Archibald Menzies, Scottish botanist and surgeon with Captain George Vancouver, was first to collect specimens for transport to foreign shores, in Monterey in December if 1792. But his classification was incorrect, his collection suffered badly on shipboard, and the plants delivered to Kew Gardens soon died. Next was Adelbert van Chamisso, French naturalist with the Russian Romanoff expedition, spending October of 1816 at San Francisco. Here he collected, described, classified, and named Eschscholtzia californica after the ship's noble young surgeon, Johann Friedrich Escholtz. Finally, it came to David Douglas, Scottish botanist and practical gardener, to convey this vibrant poppy to the world. Collecting along the Multnomah (Willamette) River in 1825, he first encountered E. colifornica and sent back to the Horticultural Society of London the seeds that thrived in English gardens and beyond.